Antoine Griezmann has given fans a brief insight into the sensational team he has assembled on Pro Evolution Soccer – and they even wear Arsenal kits. The Atletico Madrid forward posted a video of him scoring a goal with Dutch icon Johan Cruyff before then sharing an image of the fearsome squad he has assembled. My Club mode is among the most popular on Pro Evo and is played by millions of users around the world every day. It lets gamers build a dream squad and then compete with it in a variety of single player and online modes. The Frenchman showed loyalty to only one of his club colleagues with Jan Oblak picked to start in goal for his team. 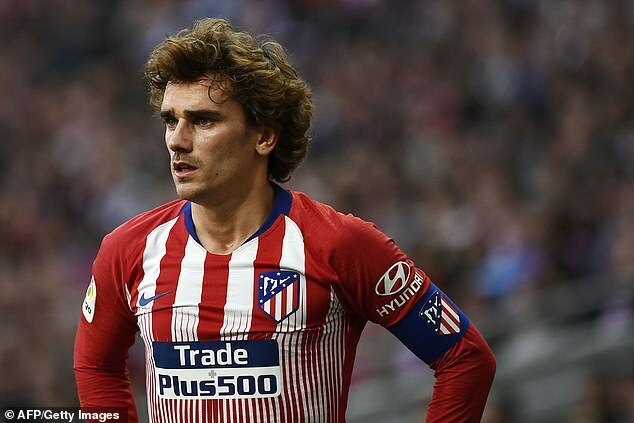 Griezmann opted for a 4-2-3-1 formation and selected a back four consisting of two fellow La Liga players. There was no bias against Atletico’s city rivals with Sergio Ramos and Raphael Varane partnered in the heart of the defence with Arsenal’s Hector Bellerin and Alex Sandro of Juventus on the right and left respectively. Patrolling just in front of the defence was a defensive midfield pairing of David Beckham and Paul Pogba, who Griezmann won the World Cup alongside for France last summer.